Jaipur: A community panchayat in Rajasthan has unanimously favoured prohibiting girls from using personal mobile phones in order to ensure that they do not get involved with boys. Alarmed by the case of a girl who eloped with her boyfriend a few days back, elders of Bhandarez town in Dausa district decided to impose the ban in an all-caste meeting held yesterday. “It is a matter of serious concern that the use of mobile phones is causing unwarranted problems particularly when it comes to youngsters. Girls using mobile phones are easily connected and approachable and this freedom may create unnecessary problems for her family”, Durga Lal, Sarpanch of Bhandarez, who was present in the meeting, said today. “Considering this fact, it was the common opinion in the meeting that the girls should be prohibited from using personal mobile phones and also scarves, which helps in hiding identity”, he said. Saini said that a well-educated adult girl eloped with a class 10 drop out boy of some other caste on October 26 and is untraceable since then. “It was a common opinion, passed unanimously, not a binding decision. If anybody wants to allow girls in his family for using and carrying personal mobile phones, he can do so but I hope that everybody would follow the common opinion because ultimately it is for good”, he added. He also added that the panchayat also requested the local police to expedite efforts in tracing the girl as soon as possible. A local villager Santosh also said that the villagers were in agreement with the panchayat’s directive. SP Dausa S N Khinchi said that nobody has approached the police against the decisions or opinion of the meeting. 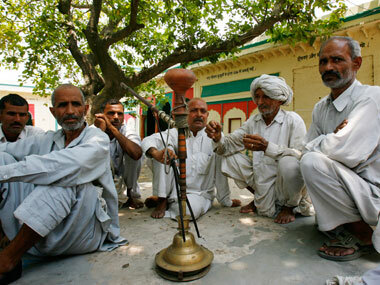 “So far, there is no complaint against any panchayat’s decision. We will look into it if there is any complaint”, he said.